Imagine if you discovered a treasure chest in which were hidden ancient mysteries, revelations from heaven, secrets of the ages, the answers to man's most enduring, age-old questions, and the hidden keys that can transform your life to joy, success, and blessing…This is The Book of Mysteries. 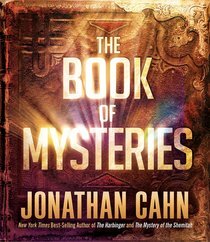 Jonathan Cahn, who caused a national and international stir with the New York Times best-seller The Harbinger and then The Mystery of the Shemitah, now brings us a treasure chest inside of which are contained some of the greatest mysteries of all time. The reader will discover life-transforming secrets, mind-blowing realities, and heart-changing revelations in such mysteries as the Face in the Waters, the Leper King, the Land of Gezarah, the Secret of the Third Prince, the House of Spirits, the Mystery of the Rains, How to Alter Your Past, the Second Scroll, the Similitude, the Mystery of the Eighth Day, and much more. The Book of Mysteries takes the readers on a journey of divine revelation through ancient Scriptures, the laws of Creation, the deep of God's Word, the hidden streams of history, the most important keys of spiritual truth, end-time mysteries, and the secrets of life. The Book of Mysteries opens up with a traveler and his encounter with a man known only as "the teacher." The teacher takes him an on odyssey through desert mountains, valleys, gardens and plains, encounters with nomadic tent dwellers, caverns and ancient ruins, chambers of scrolls and vessels, and more. The reader is taken along to partake in the journey and in all the teachings and revelations. The traveler keeps a journal in which he writes down each of the mysteries given to him by the teacher in his one-year odyssey-365 different mysteries-one for each day of the year. Thus, on top of everything else, The Book of Mysteries is also a daily devotional unlike any other. And each mystery contains a special mission for each day of the year, a mission that takes the revelation and applies it to reality for a life-changing journey. About "The Book of Mysteries (Unabridged, 5 Mp3 Cds)"
Customer Reviews For "The Book of Mysteries (Unabridged, 5 Mp3 Cds)"
Such an amazing devotional book. I read a page to my family at our devotions time and they love it. We have now added this book to our list. This book works best as a devotional - each day opens up a new topic from the scriptures and sheds light on  'mysteries' from a fascinating Messianic Jewish perspective. Each topic is thought provoking and could inspire further study - and there is included a reference to a related teaching resource for each day's topic as well to Scriptures for meditation. Each day's topic is short and to the point with specific applications included. The book is written in a style similar to the 'Harbinger' in that it features an ongoing discussion between 'The Teacher' and a student. This discussion is used to introduce, illustrate and bring out each of the mysteries. The book includes a useful index of topics at the front and I highly recommend checking it out.